A couple of weeks ago, I acquired another loom. 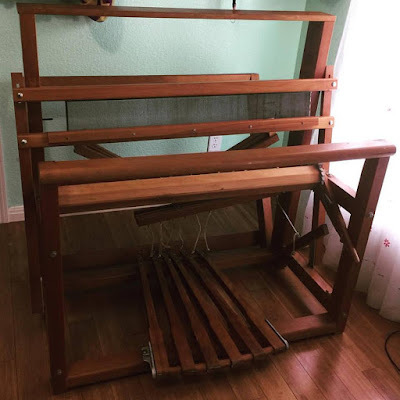 I was not actively looking for a loom, but Facebook has this local marketplace that pops up to feature what neighbors have for sale. 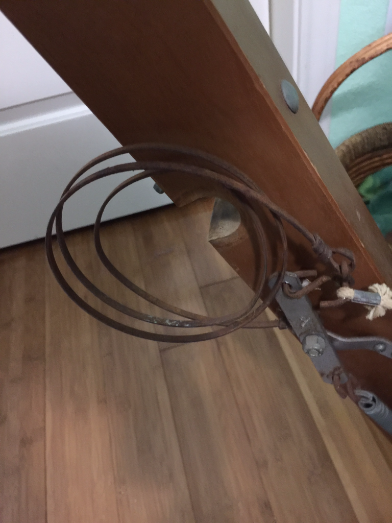 I check it occasionally to see if I can find a small table and chairs for the younger daughter, a high school Sophomore, to use when she heads to college. I like to plan ahead. 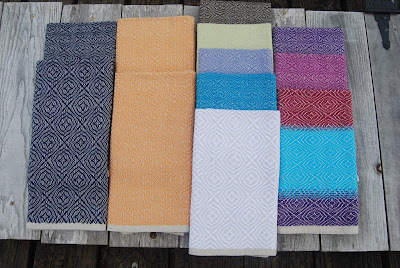 Occasionally, I come across something of weaving interest there. A few months ago, there was a Schacht 25" 8-harness table loom with stand, just like the one I used to have! I mentioned it to a good friend of mine. She bought it. 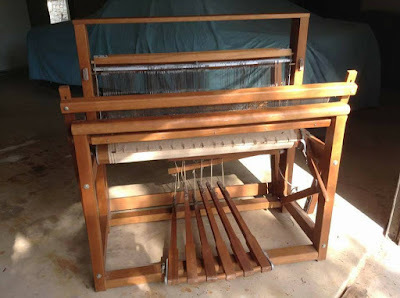 That was the first loom I came across on that page. 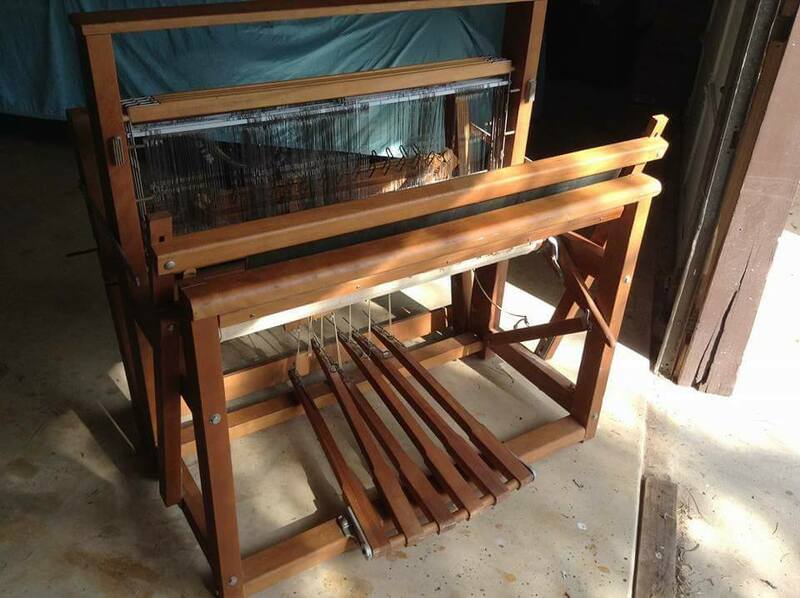 My first floor loom was a Leclerc Artisat 36" 4-harness made in 1970. She was a sweet loom. 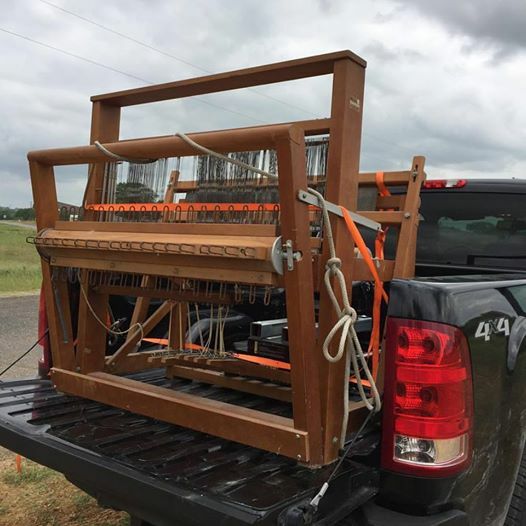 However, at the time, I wanted a bigger and heavier loom on which to make rugs, and she was a bit too light weight for that endeavor. What I like about Leclerc is they provide parts for nearly every loom made in their 125 year history. That is pretty impressive. I also emailed them with the serial number of the loom. The owner of the company, Monsieur Brassard responded personally and said: "Nilus 36" made in March 1978. Francois"
Obviously he is a very busy man of few words. As can be seen from the photos, this particular loom was in rather sad shape. There was plenty of rust and a missing crank handle, but she appeared to be structurally sound. 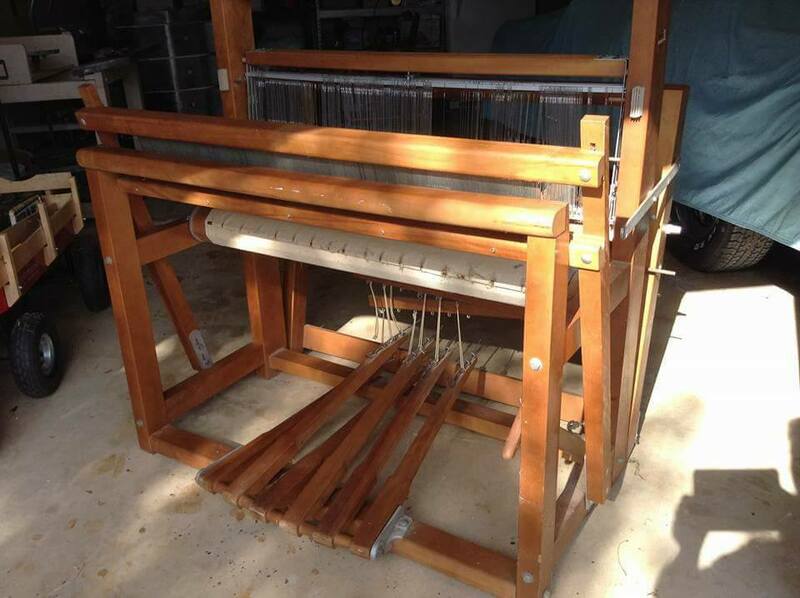 The thought process was this: I now have a Macomber loom on which I am able to weave the finest of lace, as well as durable rugs. It is also massive at 56" wide. 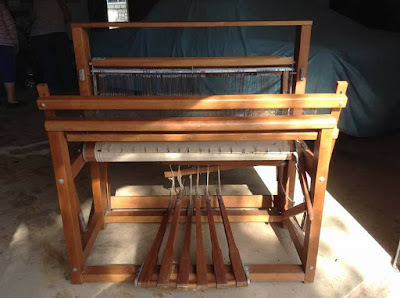 My issue was not to replace the Macomber (Let me be perfectly honest, the Macomber is a DREAM loom, and I have no intention of ever parting with it), but the ideal weaving studio, which existed in my mind, included a smaller secondary loom on which to do small to mid-size projects while the Macomber did the all the beefy lifting. When I contacted the seller to inquire of the loom, she explained she had posted the listing on behalf of her grandfather. The loom belonged to her grandmother who had dementia. Neither the lady, nor her grandfather knew anything about the loom. She asked me to make an offer. 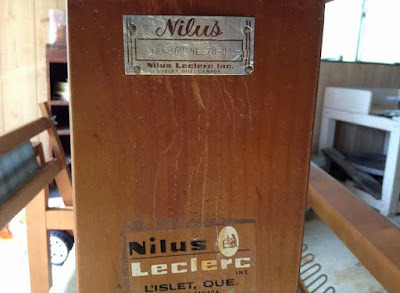 After a bit of research regarding how much 40 year old Nilus looms were selling for in excellent condition, as well as trying to guess how much it would cost to get her up and working, I gave her an offer. She and her grandfather accepted it. When the husband and I went to retrieve it, the people were lovely and nice; however, instead of being stored in a garage, it had actually been in a barn. 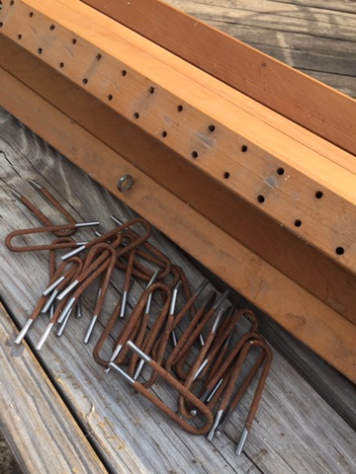 I could see where they had knocked off several dirt dauber nests on the sectional beam, but there were a couple more in the lam box. There was no crank, the gentleman asserted it had not come with one. 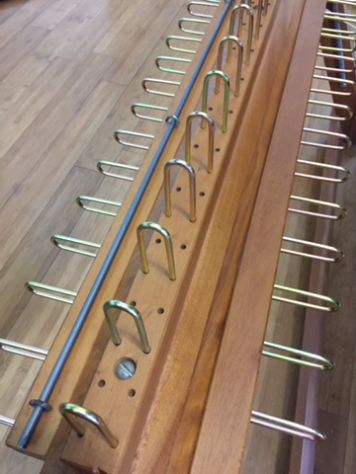 The heddles were once new and due to the strings running through several bunches on them, they may have never been used; however, they were badly rusted, along with the brake circle, and all of the section brackets on the warp beam. Surprisingly, there were no signs of water damage. The wood looked great, and she was still sturdy. At about 175 pounds, she was far easier to move than the 400 pound Macomber beast! We brought her into the foyer, as soon as we got home, and I got busy cleaning her up. Three hours were spent cleaning before I could apply the first coat of Howard Feed-N-Wax. After a thorough inventory of what I thought she needed, as well as a couple of luxury items, I placed an order with Camilla Valley Farm. 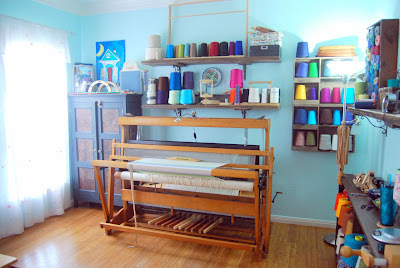 While I could have ordered directly from Leclerc (they are both in Canada), I opted for Camilla Valley Farm because their website helps identify a loom, gives the history of every loom ever made by Leclerc, and they have an exhaustive collection of loom manuals. PLUS, instead of just a list of replacement parts, they provide photos, which helped me identify which parts I needed. As I found out later, their customer service was also most excellent. From order placement to delivery was just shy of two weeks. 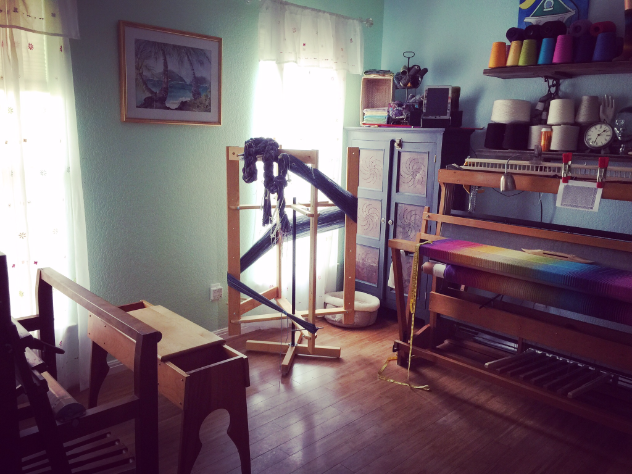 While I waited for the replacement parts to arrive, I did what I could to prepare the loom. The brake circle was completely rusted. To ensure I put the brake back, I took a photo to see how it was attached. Unfortunately, once I got the new brake circle and put the warp beam back on, it did not work. Thus, I reattached everything according to the photo. Yesterday morning, I rose early and attached a new apron to the cloth beam. After breakfast, the sweet and handy husband helped me to attach the new bumpers and the jack supports, which required the use of power tools. He also cut to size four steel rods for the warp and cloth beams. It may not sound like much, but he worked HARD! I am fortunate he is willing and capable. 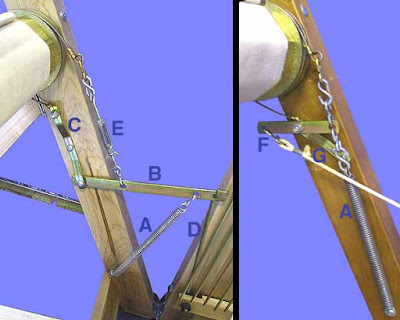 The original plan was for him to then add harnesses #7 and #8 to the Macomber (she actually holds 10), but he had worked hard (especially using a hacksaw to cut the steel rods, then grinding the ends smooth) and I was anxious to dress the Leclerc with a warp, that I asked him to work on the Macomber next week. The new brake system appeared to work well enough for me to warp the back beam. I spent most of the afternoon and evening threading heddles and sleying the reed. It was a grand moment!! Unfortunately, it was also short-lived. When I attempted to advance the warp, the ratchet pawl for the take up motion handle, which is made of cast aluminum, broke in three pieces. Here is a photo from Camilla Valley Farms. The actual piece is identified as "B." 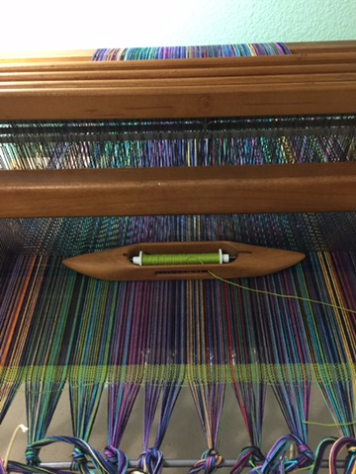 However, I am delighted with the loom. With a little more love and attention, she will be an awesome companion. Leclerc looms are made of Canadian maple. 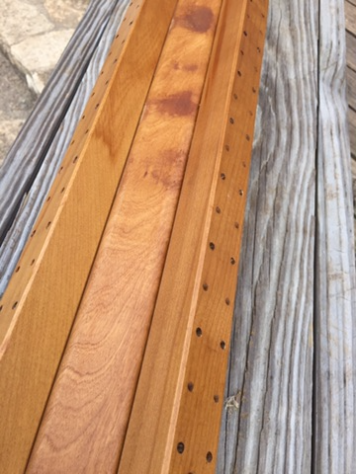 In the photo directly above, the wood is new and light in color. As this hardwood darkens over time, I have to admire what a lovely and deep shade my little beauty has acquired with her age. 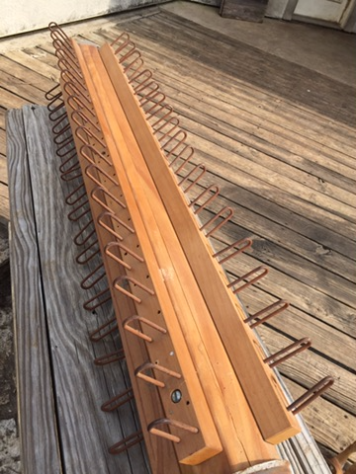 Last year I went to a Weaving Boot Camp with Susan at Yarnorama in Paige, Texas and sat on an older Leclerc bench for three days. At the time, I thought it would be a little too short for the Macomber (or I would have bought it then). As soon as I moved the Leclerc into my studio, I knew I had to have that bench. I called, and Susan agreed to sell it to me at a price that reflected its age and use! (New they are $505!) A few days later, a dear, sweet friend collected it and brought it to me! The dream studio is now complete!! I simply could not be more pleased or grateful! I've been a lurker for many years, & thought I'd finally comment! I don't weave, but I certainly can hear the enjoyment you had reviving the loom you acquired, & very lucky to have a husband supporting you as well! Enjoyed this post very much!! Thank you, Lady!! So pleased to know you are out there. I actually used Weiman's Furniture Cleaner to clean the hard wood parts of the loom, followed by Howard Feed n Wax. I applied to Feed n Wax twice. However, in retrospect, it would not have been a bad idea to wipe the entire thing down in the vinegar/water mixture, allow it to dry, then do the Weiman's and Feed n Wax.